Steelhead fishing has been incredible. The main push of steelhead is here now during May. Water temperatures are equivalent of April 20th. Steelhead is way behind schedule and fishing is great. Our main focus has been sight fly fishing for steelhead on gravel. River water has been gin clear so sight fishing has been excellent. Good pockets of fish in the upper Muskegon River near the Croton Dam. Mid section above Pine St has also been doing well. Temperature and clarity is very good. Best Steelhead flies have been brown pheasant tail nymphs, salmon fry patterns, sack fry, olive hares ears nymphs. Small egg patterns are also working well. Apricot, Steelhead orange, Oregon Cheese, and golden nugget, all working well in #8, or #10’s. Steelhead Egg Flies Fishing should remain great for the nest 10 days or more. Open May Steelhead Dates: May 8, 9, 10, 11, 12, 14, 15th..
After May 15th, guided steelhead trips are $350 for the full day. Half day afternoon trips are $250 for 4.5 hrs of steelhead fishing. George with a beautiful hen. Spring Steelhead are just beginning to spawn. May will be very good with lots of steelhead well into June this year. Jordan with a giant buck steelhead. Double digit days just starting to rock! Spring steelhead just now beginning to spawn. Two Steelhead on at a time! Yes, It’s about to be really really good fishing! New steelhead still coming in from Lake Michigan. These steelhead have been gorgeous! Spring has been a month behind with very cold water temperatures. Fishing is just now getting good ! Open May Steelhead Dates: May 5, 6, 7, 8, 9, 10, 11, 12, 14, 15th.. If you’re sitting in your office cubicle, bored, or sitting at home, NOW is the time to get out of the house and fish! May Steelhead dates are filling quickly. We are only offering the $250 half day Spring special until May 15th. Water temperatures are still very cold! 44 degrees. We are landing at least one steelhead per hour on the Muskegon. It’s a great time to be on the water with little angling pressure and lots of fish. Fishing has been excellent with last week’s high water which shuffled the deck and brought in lots of new steelhead from the lower river. Spring Chromers coming in from the lake with more to come! It’s nearly May 5th and over 90% of the Michigan Spring Steelhead migration has not even begun to spawn. All of the spawning hen steelhead have not spawned yet. Fly fishing for steelhead is phenomenal right now! If you seen the weather pattern for the past month, you’d swear it was March at best. This year’s spring steelhead feel the same way! Water temperatures are just barely in the 40’s with the vast majority of the steelhead not even ready to spawn. Gravel fishing over the past couple days has been PHENOMINAL! Double digit days have been the norm with the weather finally warming up, and water levels dropping to a perfect level. The drop has made for some very good fly fishing! Visibly sight fishing for steelhead on gravel is probably some of the best steelhead fishing you’ll ever experience. Watching a fish take your bead or fly. Exhilarating!! Bobber fishing on spinning tackle has also been effective. Very small spawn sacks in natural colors have been the best for both trout and spring steelhead. Brown trout have also been very active around spawning steelhead. Look for big numbers of steelhead during May this year. Steelhead are now just getting started and should go well into June this year. There’s lots of choices available for anglers during August. Trout fishing at the creek mouths can be excellent, offering shots at trophy Brown Trout and big resident Rainbows, or Caddis hatches in the evenings. Smallmouth Bass can be an outstanding choice for kids. Constant action and lots of bites on Smallmouth trips. We often catch lots of Rock Bass, Walleye, Northern Pike, and an occasional Tiger Musky! These trips are an action packed, fun day on the river. Trout fishing during the summer can be great if the weather is right. Lots of rain has made for decent trout fishing. It’s finally summer in Michigan, with the hot weather comes some great fishing! Smallmouth Bass, Trout, Walleye, Northern Pike, and Musky on Michigan’s Muskegon River. As a guide, I have to change it up a bit. Smallmouth and warm water species make better fishing at this time. Guiding for Trout is always my personal favorite, however, hot summer weather and warm water temps are rough on the Trout fishing and sometimes Smallmouth is a better choice. King Salmon should be a fishing option soon! Port areas like Ludington, Manistee, and Grand Haven are starting to see good numbers of salmon coming in along the lake shore. Strong North East winds push the cold water against the shoreline bringing with it, Salmon and Steelhead. We will begin salmon trips in late August on the lower Pere Marquette River.Salmon Flies for Michigan. Fall Salmon Season on the Lower Pere Marquette, Big Manistee, and Muskegon River. Fall Steelhead fishing on the Muskegon River. Float Fishing Destinations for Chrome Steelhead. 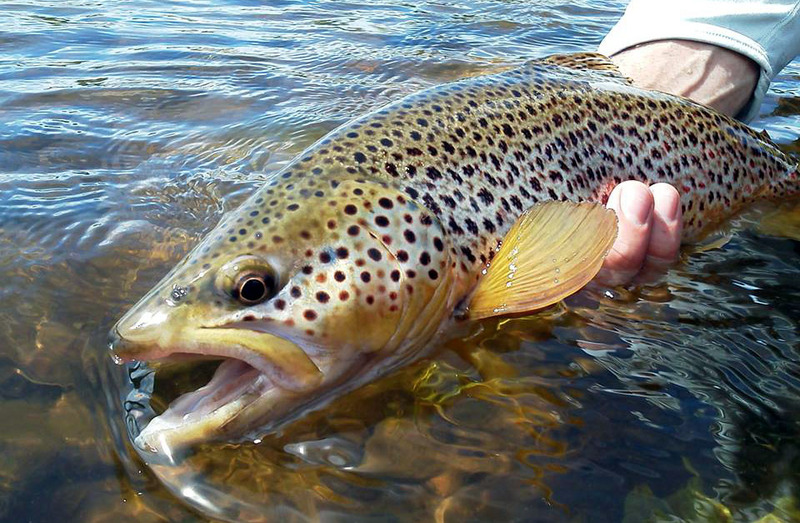 Hatch Master’s Special – Evening Guided Trips for Trout on dry flies. $250 / 2 anglers. Trout fishing on the Muskegon & Manistee River has been excellent! Possibly some of the best, most consistent trout fishing in the mid west, the area below the Tippy Dam boasts some phenomenal trout fishing. Less Rainbow Trout, but piles of very healthy Manistee River Brown Trout. I was very surprised as to number of fish rising to emerging caddis yesterday afternoon. The dry fly fishing was very good. We also caught a ton of trout on soft hackles. Tiny streamers, representing steelhead and sucker fry also fished exceptionally well. Dry fly trout fishing is our main focus at this time. Trout on the Muskegon River have been feeding heavily on the numerous insect hatches going on right now. The most prolific are the Cinnamon Sedge Caddis, Gray Drake, and the Isonychia Bicolor. These hatches take place in the afternoon and evenings. The Gray Drake spinner fall takes place right at dusk. These hatches offer some of the best trout fishing in Michigan. Evening hatch trips have been the most productive. The river is at a nice level (2000 cfs ) wadeable, and clear with water temps in the 60’s. Large numbers of salmon, steelhead, and sucker fry are present against the shoreline. Sulphurs, gray drake, and caddis are the prime hatches right now. Suckers are also starting to load up which should make for outstanding trout fishing. Muskegon River Trout feed heavily on the eggs of the spawning Red Horse Suckers. The native fish provide a staple food source for our resident brown and rainbow trout. Guided Salmon Fishing Trips . $300 for 4.5 hrs. Trees are in bloom, weather is nice, and fishing is great right now! I’m not sure words can describe how many steelhead are in the upper river. There are steelhead spawning everywhere in the upper Muskegon River right now. Super uber prime time now for the fly fishing gravel game! Double digets on eggs patterns, stones flies, pheasant tail nymphs, Stone flies, fry patterns, and getting fish in big numbers. Water levels are normal, 3940 cfs, making for perfect gravel fishing for Muskegon River Steelhead. Clarity is very good, 6′ to 10′ visibility. River is in perfect fishing condition. Should remain excellent for the next several weeks. Great News!! 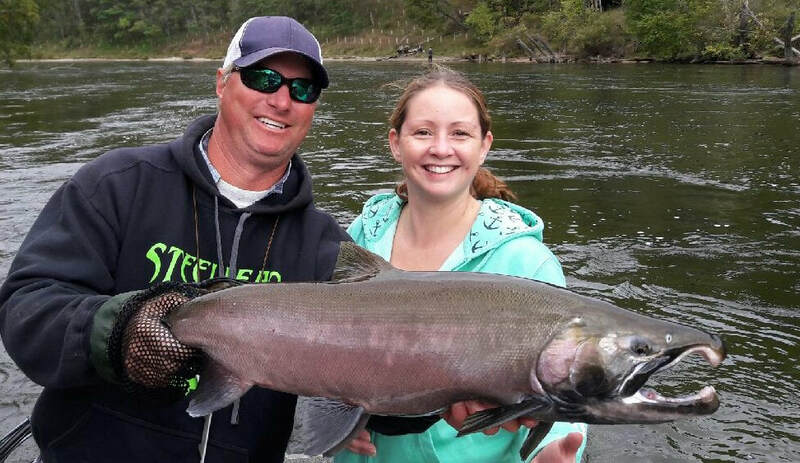 We still have another months of excellent steelhead fishing ahead of us! Steelhead nirvana and double digit days should be the norm for the next several weeks. Steelhead fishing is definitely prime time right now. Recent rains have brought bright chrome Spring Steelhead. Water is dropping! (4420 cfs) Water clarity is much more clear. You can see redds with lots of Steelhead spawning on gravel big time. Water temps in the low 50’s, and the main push is here! Everything is Prime! Steelhead fishing should be excellent for the next 15 days! Today: Water levels area bit higher today but stable and now dropping. 6000 cfs. Clarity is actually really good. 3′ – 5′. Stained but definitely not “Dirty” chocolate milk. River temperature: 41 – 42 degrees. Recent rains and perfect conditions have made for some great Steelhead fishing over the past three days. The bump in the water levels have brought a new shot of bright chrome fish into the upper sections of the Mighty Muskegon River. Small chartreuse spawn sacks, trout beads in natural colors. stone flies, and jigs tipped with wax worms have been producing a lot of fish. Steelhead have moved from winter holding areas to faster spring runs and gravel areas. Fishing should be excellent for the next several weeks. Lots of fish throughout the system with many of them actively spawning. 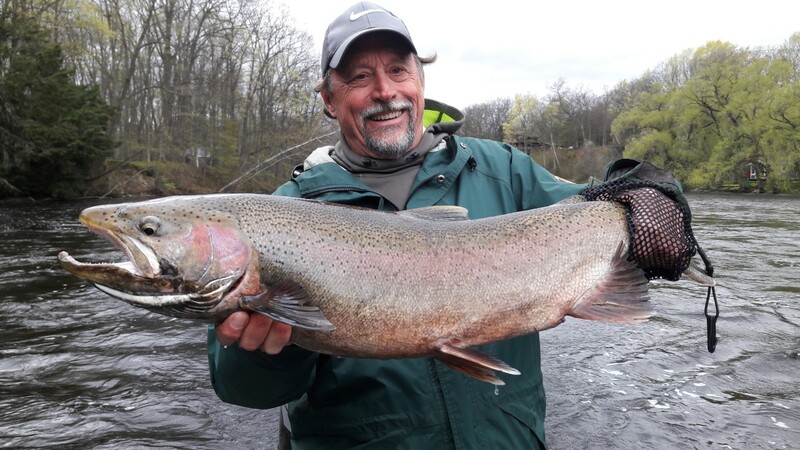 Here are our available dates for April Steelhead – Muskegon River. April 11, 12, 13, 16, 17, 18, 19, 20, 21, 22, 23, 24, 25, etc.. This Could Be You! Paul with a GIANT Beastly Buck! This steelhead gave an awesome battle, was all over the river! Trophy Steelhead for sure! The Boys from Ontario just butchering the fish!! Centerpin beat down on some steelhead – Epic afternoon. Who lands 15 steelhead in 3 hours? These guys! Chris with a chrome bullet hen. Starting to see a lot bright fish, with many beginning to spawn. Pretty much all the local rivers are going strong right now. The Muskegon, White, Pere Marquette, Big Manistee, and Grand Rivers are all fishing very well. Grand River, Muskegon, and White River are really on fire! A lot of chrome fish showing up, and quite a few starting to hit gravel. We landed a drop back female (spawned out) today, so some steelhead are spawning in deep water runs. Float fishing with spawn, beads, or jig and wax worms are all fishing well. We’ve also been doing great with those crazy pink worms from Raven Tackle, or Berkley Power Worms. Basically, we’re landing a lot of steelhead each day. Half day afternoon trips are also fishing very well. They’re Here! I’m happy to say that Jake and I both had our first double digit day of the spring. A good mix of bright chrome hens, and some hold over males. We had a phenomenal bite most of the day. Small chartreuse spawn sacks were the key (4 egg bags). We also landed two hens that were spilling eggs this morning. Starting to see some polished gravel with some of the winter steelhead beginning to spawn. Gravel fishing will definitely be going early this season with fish already starting to spawn this early. It’s going to be a great spring steelhead migration but, it’s going to be short and quick. I’m making the prediction that the Muskegon River Spring Steelhead run will be over by April 15th… We are seeing April numbers now already. Holy crap that’s a big buck!! Liam with a colorful buck Steelhead. New fish showing up daily. Alex with a very beautiful. Each day these fish are getting closer and closer to spawning. Float Fishing for Spring Steelhead. The pictures above tell exactly how we love to spend our March days with clients. Limits of bright chrome, spring steelhead, and fish in the net! Winter is over and spring has sprung! The Muskegon river is now full of these beauties! Steelhead fishing has been right on track so far this week with new fish entering the river daily. The past three days have offered some very good steelhead fishing. We are averaging one steelhead per hour in the net, and trout have also been plentiful. Water temperatures are about normal. (36 – 37 degrees.) The warm spell last week brought in a lot of new steelhead into the upper sections of the river. Water conditions are just about perfect with water levels, (3600 cfs) clarity, (3′ -5′) and temperatures. It will be very nice this season, not having snow melt flood conditions this year. It’s gravy time from this point forth. Chrome bullets showing up every day! New fish coming into the river to spawn. Float fishing center pin with beads and spawn has been excellent! During the past few days we’ve been catching many bright chrome steelhead. Looking forward to good numbers of Spring Steelhead. 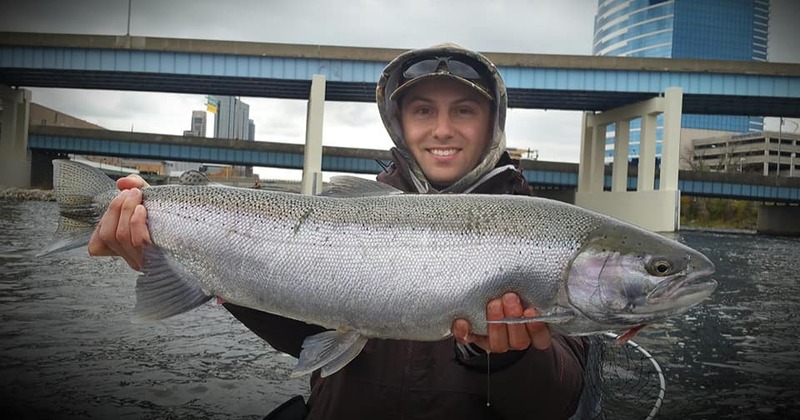 Muskegon River Steelhead Guides for Michigan. Toby with a PM Beast! Chrome fish entering the river. Grand River Salmon fishing has been great the last couple of days! Recent rains have brought in a large push of Coho Salmon below Sixth Street. Good numbers of Chinook, Skamania Steelhead, and Lake Run Brown trout are also present. Salmon and Steelhead fishing in Grand Rapids is very under rated. 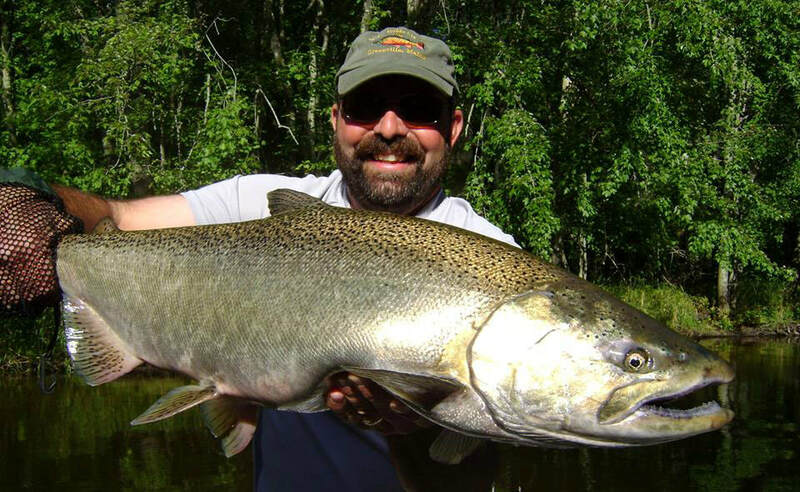 The Grand River receives one of the largest migratory Coho – Steelhead runs in Michigan. 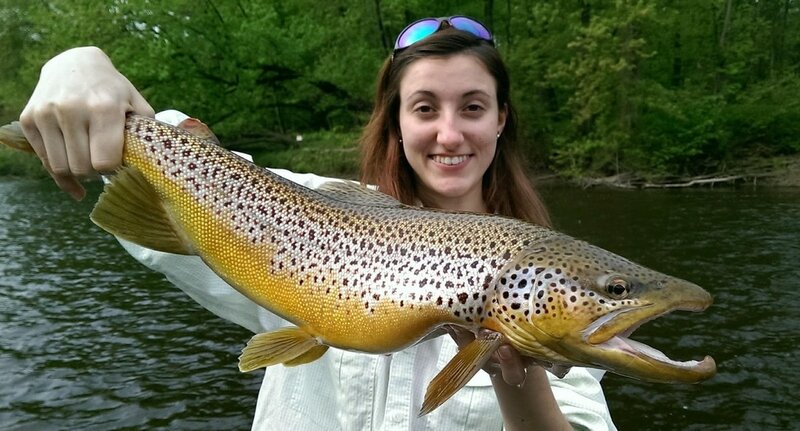 We offer guided fishing on the Grand River, Rogue, White, Pere Marquette, and big Manistee for Trout and Salmon during the Summer, Fall, Winter, and Spring. Come and join us for outstanding Fall Fishing! Due to everything being late this fall, October should offer exceptional late season salmon. Last Fall, October dates hooked the most fish per day by far. Chinook salmon run well into late October for great fishing! Casting Thundersticks for bright chrome Kings on the Pere Marquette & Big Manistee Rivers. Salmon Season 2015. Our available open dates are September 14, 15, 17, 18, 28, 29, 30. Any dates in September that are not listed are already booked, mornings. Afternoon Charters ( 3:30pm – 7:30pm) are available for $250 per 2 anglers. We are guiding salmon on the Pere Marquette & Manistee Rivers. 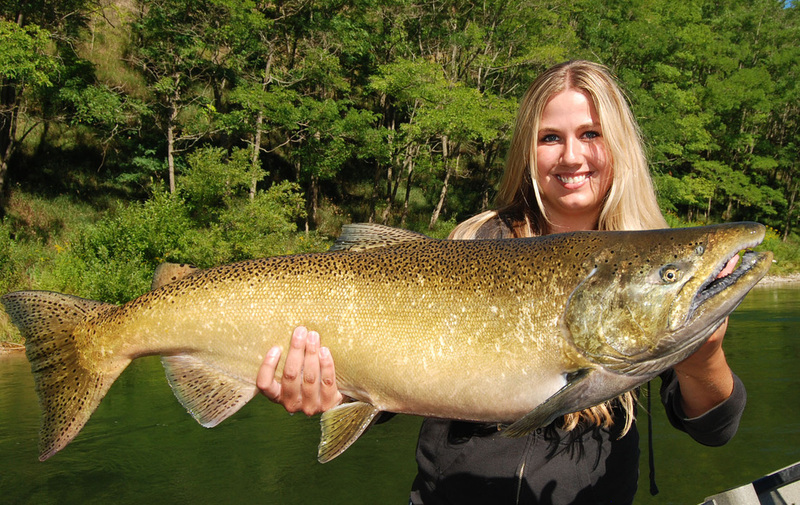 Kelsey with a very nice male Chinook salmon from the Manistee River near Tippy Dam. Salmon fishing on the Pere Marquette River and Manistee. Salmon fishing coming soon! Book now before dates are filled! We are still guiding for Smallmouth and Trout at this time but, Salmon fishing is just around the corner. Both the Pere Marquette & Manistee Rivers each have a handful of salmon at this time. Conditions should improve as we get later into the month. Early Season salmon are a blast whether casting thunder sticks, or float fishing bobbers and skein, both produce great catches. Later September, and October, we will be fly fishing the Big Manistee River. We expect a different class of angler now on the Manistee River, as this section of river, (Below Tippy Dam) is single hook only for salmon, fly fishing should be phenomenal this year as most anglers will be fishing legally this year. Endless possibilities for great fishing this fall on the Manistee River below Tippy Dam for salmon. We are certainly excited! Send us a text or an email. (231) 519-7348 or follow our FaceBook Reports. Robbie with a trophy Muskegon River Smallmouth Bass from Shangri-La. Late August offers the best in Smallie fishing during late summer. River trips offer a fun adventure before the kids head back to school. The weather is hot and summer is winding down. There is still tons of fishing oppertunities to do before the kids go back to school. During the dog days of August, top water smallmouth is at it’s best! Vicious strikes and big smallies coming to the net! Smallmouth Bass Shang-ra-la! Another overlooked fishing opportunity is terrestrial fishing for big trout. Trout love crickets, grasshoppers, and a Muskegon River favorite, the flying ant! Trout love terrestrials during the later part of the summer. Now is also the time to make your reservations for Chinook Salmon trips. We only have a limited amout of dates for salmon and prime dates good fast! Fall Steelhead fishing is also on the horizon! April displays a giant late summer Smallmouth Bass. August and September offer the best in really big Smallies! Top water action is great when water temperatures are warm. Late season Smallmouth Bass on the Muskegon River. Bone jarring strikes from Smallmouth Bass on top water buzz baits! August Smallmouth. Fired up about Atlantic Salmon! These amazing fish chase down and hammer small flies and minnow imitations during late summer! Come just us for great white fish fishing and Atlantic Salmon up North! Available August 2 – August 15. Cooler Weather up North, and Atlantic salmon on the brain! For the past 10 days we’ve been fishing in Northern Michigan for Atlantic salmon. These fish are amazing, taking small flies in an aggressive fashion. Fly fishing and spinning tackle has been very effective for these fish! These fish are incredible! Huge jumpers! Hot weather and summer Smallmouth are upon us. If you’re looking for an affordable, action packed guided fishing trip before school starts, check out Smallmouth Bass on the Muskegon River. Smallies just love top water lures, poppers, and soft plastics! Awesome jumps, hard hits, and down and dirty fights on light tackle! Michigan Smallmouth can’t be beat! Summertime offers excellent Smallie fishing on the Muskegon River. We offer light spinning tackle, Bait caster, and fly fishing for big Smallmouth Bass on West Michigan Rivers. Steve with a giant Smallmouth Bass from Hardy Pond on the upper Muskegon River. Summer produces big Smallmouth. 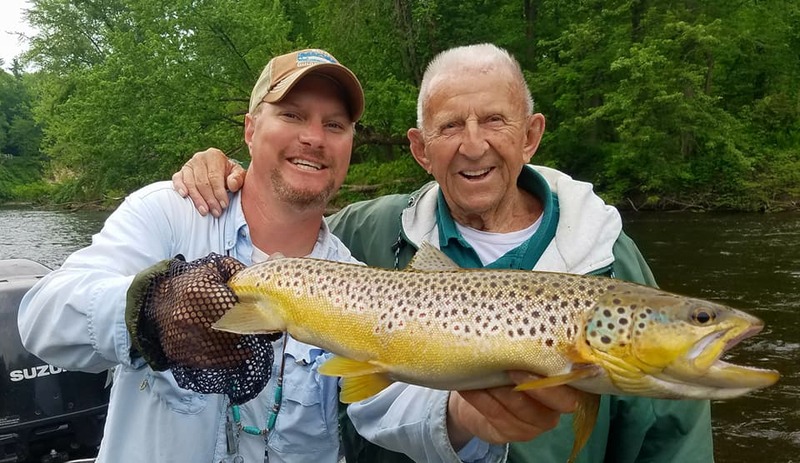 July 3rd – Hatch fishing and dry fly fishing has been outstanding during the last couple of days! We’ve been spending a lot of time doing boat – wading trips and having great success for some really nice quality trout. Best hatches have been cinnamon caddis, which have been popping (emerging) regularly every evening from 7pm well into the night. Soft hackles and wet flies have also been fishing well while swinging them on a floating line in the surface film. Hatch trips are from 5pm – 10 pm. Caddis Emergence & Dry Flies. We had an epic day today fishing streamers for trophy brown trout & Steelhead!! Water levels are perfect for great trout fishing, whether nymphing, streamers, or dry flies, conditions are ideal for days over 30 trout or more in an outing. Hatches are also going to be prime time next week with rain and warmer weather. Expect great hatches of caddis, Gray drakes, and Isonychia bicolor – Making for some great trout fishing! We are offering morning (Spinning) or evening (Fly Fishing) – 5 hour half days for $250. Morning half days are available for Trout and Smallmouth on Light Spinning tackle.